The findings of a new study by technology, policy and management consultancy firm ICF International on the costs of complying with California’s Low Carbon Fuel Standard (LCFS) finds economic and environmental benefits resulting from the State policy, including an increase in jobs, incomes and gross state product. California’s LCFS requires a ten percent reduction in the carbon intensity of transportation fuels by 2020. Through a system of credits and deficits, the mandate includes the gradual introduction of fuels with lower carbon intensity than diesel and gasoline. Initiated in 2007, the LCFS has been underway for some time, but the costs and relative efficiencies have been an open question until now. The study finds that the LCFS will result in $1.4 billion to $4.8 billion in societal benefits by 2020 from reduced air pollution and increased energy security, all while generating 9,100 jobs in the State of California. The study finds the potential costs of compliance for the petroleum industry to be between $0.06 and $0.19 per gallon. This is a small fraction of the average price fluctuations for diesel and gasoline in California caused by changing global oil prices. In fact, the study finds that Californians’ fuel bills are going down, a trend which it expects to continue under the influence of the State’s progressive transportation policies (see diagram). 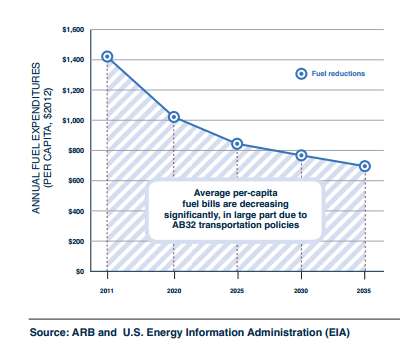 But what does this mean for the growth of natural gas vehicles in California? Join us in our next installment of this blog series where we’ll take a closer look at how carbon intensity reduction programs like California’s are spurring on natural gas in transportation.